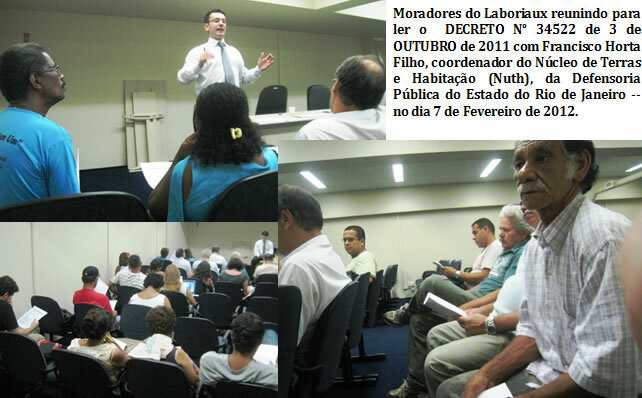 On February 7th eleven residents of Laboriaux participated in an important meeting/reading with Dr. Francisco Horta Filho to study the Municipal DECREE (DECRETO) N°34522, published on the 3rd of OCTOBER of 2011. Francisco Horta Filho is the new coordenador of the Núcleo de Terras e Habitação (Nuth), or the Nucleus for Land and Housing, of the Defensoria Pública do Estado do Rio de Janeiro (Rio de Janeiro State Public Defender’s Office). The DECREE, signed by Mayor Eduardo Paes is an improvement from the past practices, which causes widespread atrocities (arbitrary forced evictions and persistent threats of forced evictions).After careful reading with Dr. Francisco, however, it became apparent that the document is more complicated than the average (anyone who isn’t an attorney in Rio) person is likely to understand. The official DECREE – which is four pages long and has 9 pages of complex attachments – addresses fundamental procedures that must be followed in cases of forced eviction, demolitions and the removal of residents of impoverished communities. All of the procedures/laws stated in the decree already exist in Brazilians Federal, State and Municipal laws, but the majority had been ignored or brushed aside by Paes and his administration since they began their steadfast war against Rio’s working poor and their communities in 2009/2010. Eduardo Paes was very hesitant to sign this DECREE because he knew that doing so would be like shooting his own foot. If it is widely distributed it would make it more difficult for him to continue past practices. He only signed it under intense pressure from organized residents of threatened favelas, like Laboriaux, Estradinha, and Vila Autódromo, and from Nuth. At the meeting we read the entire document and offered our advice, after Dr. Francisco provided his while also explaining the difficult and esoteric legal jargon. It turns out that while the DECREE lays out regulations, that if followed would be an improvement from what favela residents have been facing, through calculated selection of wording it leaves many dangerous possibilities open. We made dozens of recommendations and that will be presented to the City in March of 2012. If our recommendations are taken seriously then the DECREE will prove to be a truly powerful and beneficial tool for all vulnerable residents of Rio de Janeiro living in threatened communities. It will be important that as many favela residents as possible have a copy of the DECREE, the way it stands now and the way we hope it will stand later this year. If our suggestions are not considered then we will enter into legal proceedings against the City. We already began distributing the DECREE in Laboriaux, having pass out more than 100 copies (which is about 1000 pages with all the attachments). 823 families (or roughly 3,200 residents) of Laboriaux will soon receive property titles and deeds to their homes and businesses. It looks like Laboriaux’s and Mundo Real’s persistent pressure is starting to change the scenario here. We received a copy of an Official Bulletin from the City’s Secretary of Housing stating that 823 families (or roughly 3,200 residents) of Laboriaux will soon receive property titles and deeds to their homes and businesses. It this is true it will be a tremendous victory for a community that was doomed to forced eviction less than 2 years ago. Indeed the engineer (GEO-RIO) responsible for the major projects currently taking place here told us a year ago that the entire area would be razed, but if we could make enough noise then it would be possible to could change this outcome. Looks like our persistence may have proved essential, and we will keep posting information as events unfold.